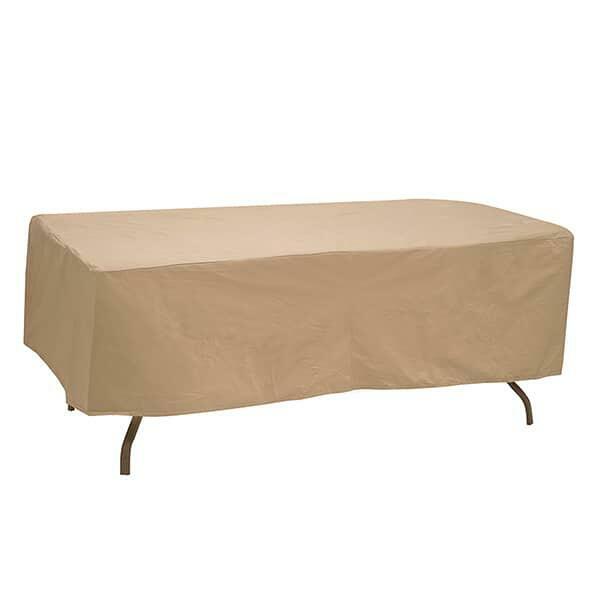 The Protective Covering Inc 60’’ – 66’’ Oval Rectangle Table Winter Cover is made specifically for one single table. The table may be either oval or rectangular in shape, and measure between 60’’ and 66’’. A PCI covering is meant to protect furniture for storage, whether it’s overnight storage during inclement weather or seasonal storage during winter or other times of non-use. The PCI coverings offer something that other vinyl coverings don’t: a sophisticated two-layered backing. Most vinyl covers you’ll find feature a fuzzy backing that flakes off and degrades with exposure. It does not reinforce the protection of the vinyl fronting. PCI changes that traditional design by reinforcing the vinyl fronting with an equally durable backing of polypropylene. The polypropylene is first compressed and then laminated onto the fronting to create a layered reinforcement. Patio furniture is a big investment. Make sure that your outdoor dining table sung and safe during the off-season.